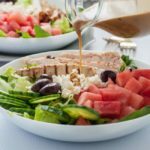 This Skinny Greek Chicken Bowl features succulent lemon-herb flavoured chicken breasts with sweet watermelon, feta cheese, cucumbers and Kalamata olives on a bed of arugula, drizzled with a balsamic reduction. We love eating a healthy whole-meal salad for dinner at any time of year. This Chicken Fajita Bowl with Cauliflower Rice and this Citrus Avocado Salad with Shrimp are two of our favourites. 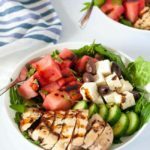 This Skinny Greek Chicken Bowl is a perfect summertime salad to kick of a season of eating outdoors! 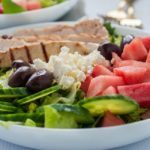 This Greek Chicken salad is succulent, sweet and salty. With a perfect balance of flavours and textures, this has been a popular recipe on the blog. I’ve updated it with new photos and tweaked the recipe slightly by adding one of my favourite vinaigrettes. Marinating boneless, skinless chicken breasts greatly improves their flavour. This recipe uses a simple Greek marinade made with lemon, red wine vinegar, garlic and herbs to flavour the chicken. You can either bake or grill boneless chicken breasts. 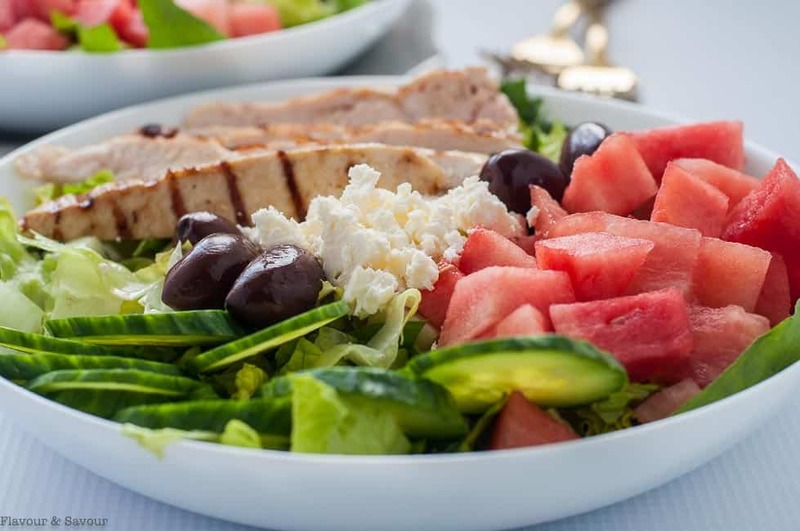 While they’re cooking, arrange a bed of fresh arugula and other greens, then add sliced cucumbers, cubed watermelon, crumbled feta cheese, and pitted Kalamata olives. Arrange sliced cooked chicken on top. Drizzle it all with balsamic vinaigrette, then happily eat off your lap in the sunshine! Ready to eat in about half an hour! Looking for an easy summertime supper? 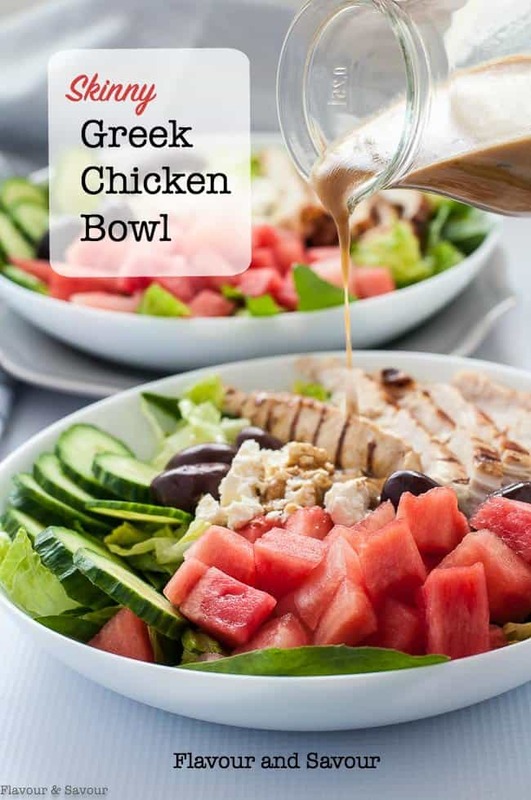 This skinny Greek chicken bowl may be just what you’re seeking. It uses simple, everyday ingredients and can be on the table in about 30 minutes! 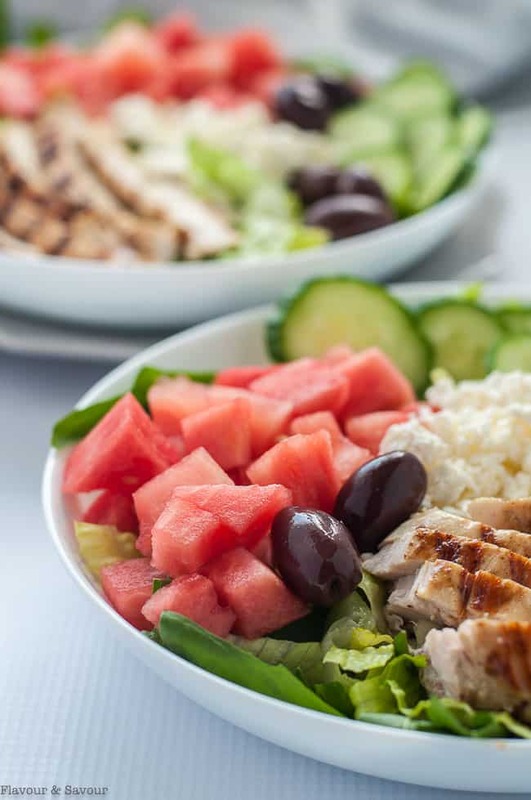 This Skinny Greek Chicken Bowl with Watermelon and Feta, drizzled with Balsamic dressing features succulent chicken marinated with lemon and herbs, sweet watermelon, feta cheese and Kalamata olives. 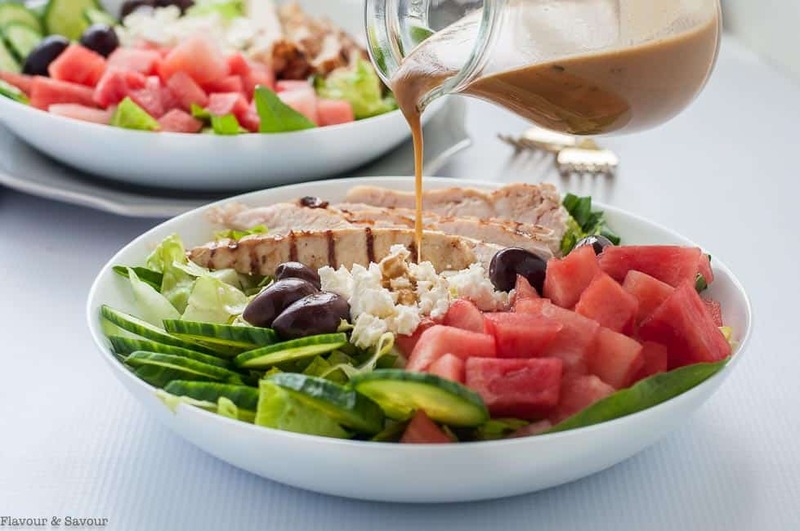 Whisk Balsamic Vinaigrette ingredients together or shake in a small jar or combine in a small food processor. Set aside to allow flavours to blend. Put chicken breasts in a glass bowl. Whisk marinade ingredients together (olive oil, lemon juice, red wine vinegar, garlic, oregano, salt and pepper) and pour over chicken. Allow to marinate in refrigerator for 45 minutes to 2 hours. Heat oven to 400°F. Remove chicken from marinade. Bake (or grill chicken) for 20 - 25 minutes or until it reaches an internal temperature of 165°F. Arrange greens in bowls. Top with watermelon cubes, crumbled feta, cucumber, olives and cooked sliced chicken. 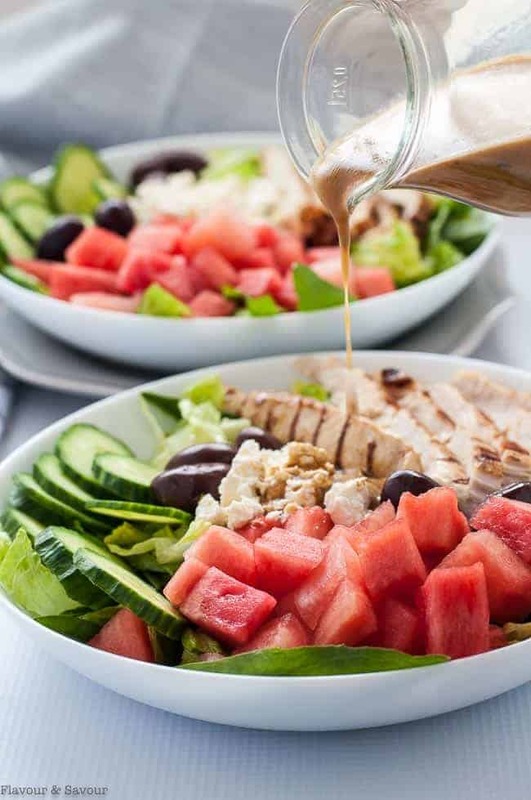 Drizzle with Balsamic Vinaigrette or serve on the side. Thanks for joining me around our table. I love having you here! 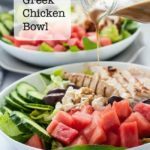 Like this Skinny Greek Chicken Bowl recipe? Pin it or share it! Subscribe to my weekly newsletter and never miss a recipe. Yum, I”m in full scale grilling mode right now, and this looks perfect!